So far, we have focused exclusively on pivot tables that are generated from a single table of data. Data Model feature has brought additional advantages to pivot charts. With the Data Model, we can use multiple tables of data in a single pivot table. We have to create one or more “table relationships”, so the data can be tied together. The following figure shows parts of three tables that are in a single workbook. Each worksheet is in the same workbook, just shown in the separate window. The worksheets are Orders, Customers, and Regions. Every worksheet has a table and I have also named these 3 tables as Orders, Customers, and Regions (to keep it organized). The Orders table contains information about product orders. The Customers table contains information about the company’s customers and the Regions table contains regional information. Using these three tables we shall create a pivot table, using the Data Model. If you look at the tables closely, you will find that the Orders and Customers tables have the CustomerID column as common, and the Customers and Regions tables have the State column as common (download the working file to see the common things). We shall use these common columns to form relationship among the tables. Notice that the relationships between the tables are “one-to-many”. For every row in the Orders table, there is exactly one corresponding row in the Customers table, and that row is determined by the CustomerID column. Similarly, for every row in the Customers table, there is exactly one corresponding row in the Regions table, and that row is determined by the State column. Note: A pivot table created using the Data Model has some restrictions, when compared with a pivot table created from a single data table. Most notable one is: you can’t create groups. In addition, you can’t create calculated fields or calculated items. Our goal in this example is to summarize sales by state, by region, and by year. 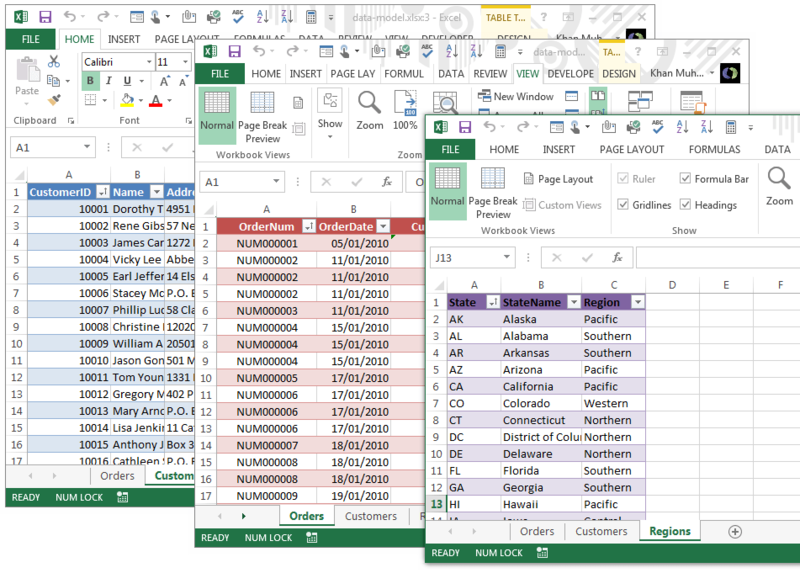 Notice that the sales and date information is in the Order table, the state information is in the Customers table, and the region names are in the Regions table. Therefore, we shall use all these three tables to create our target pivot table. Select any cell within the Orders table and choose Insert ➪ Tables ➪ Pivot Tables. The Create PivotTable dialog box will appear. Choose the data that you want to analyze and Choose where you want the PivotTable report to be placed – these two options will be as it is. Select the Add This Data to the Data Model check box and click OK. 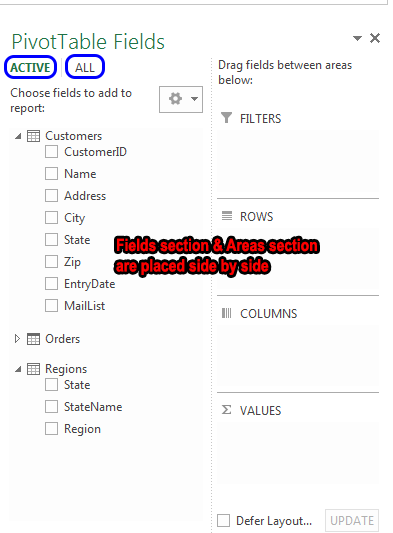 Select the Add This Data to the Data Model check box and click OK. If you look at the PivotTable Fields task pane (on the right side of the newly created worksheet), you will find that it is a bit different as this time we’ve selected to work with Data Model. The task pane contains two tabs: Active and All. 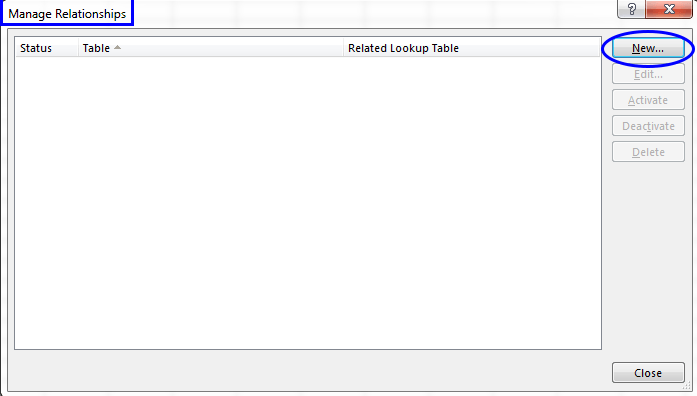 The Active tab lists only the Orders table and the All tab lists all the tables in the workbook. You can take any table under the All tab to the Active tab. To take the Customers table under the Active tab, activate the All tab, right-click the Customers table, and choose Show in Active Tab from the options. Then do the same for the Regions table. The following figure shows the Active tab of the PivotTable Fields task pane. Customers and Regions tables are expanded to show their column headers (field names). I have also changed the configuration of the task pane (task pane layout). To get this change, click on the Tools control and from the drop-down menu, I’ve chosen Fields Section and Areas Section Side-by-Side. The PivotTable Fields task pane, with three active tables under the Active tab. Now we are going to set up the relationships among the tables. Choose PivotTable Tools ➪ Analyze ➪ Calculations ➪ Relationships. The Manage Relationships dialog box will appear. Click the New button. The Create Relationship dialog box will appear. In the Table drop-down, select Orders, and in the Column (Foreign), select CustomerID; in the Related Table, select Customers and in the Related Column (Primary), select CustomerID. Creating a relationship between two tables. Now Orders table’s customerID is related to Customer table’s customerID. Click OK and you will be returned to the Manage Relationships dialog box. Click New again. 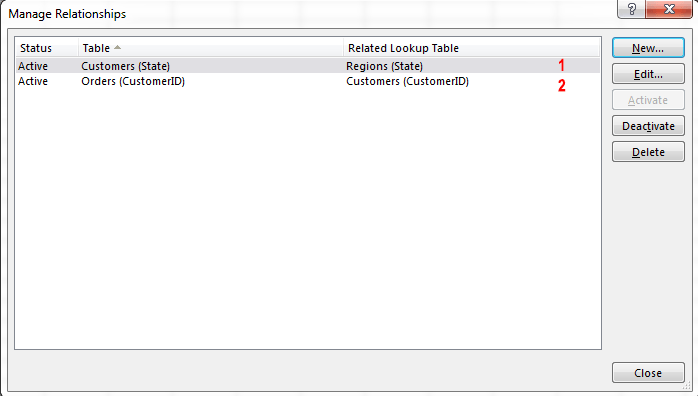 Now we are going to create a relationship between the Customers table and the Regions table like the following figure. Creating a relationship between Customers table and Regions table. The Manage Relationships dialog box will now show these two relationships. Manage relationships dialog box now showing two relationships. Note: If you forget to set up the table relationships in advance, Excel will prompt you to do so when you will try to add a field to the pivot table from a different data table. ■ Drag the Total field to the Values area. ■ Drag the Year field to the Columns area. ■ Drag the Region field to the Rows area. ■ Drag the StateName field to the Rows area. The following figure shows part of the pivot table. I added two slicers (MailList, and Product) to enable filtering the pivot table by customers who are on the mailing list, and by product. The pivot table, after adding two slicers to filter the pivot table. Tips: You can convert the pivot table to formulas. 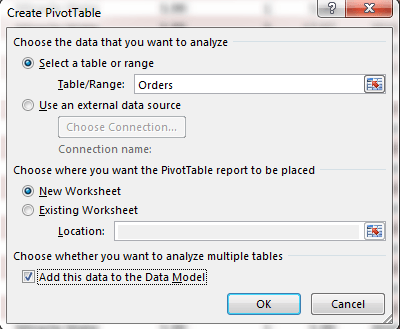 To do this, select any cell in the pivot table and choose PivotTable Tools ➪ Analyze ➪ OLAP Tools ➪ Convert to Formulas. The pivot table will be replaced by cells that use formulas. These formulas are generated with CUBEMEMBER and CUBEVALUE functions. Although the new range of data will no longer be a pivot table, the formulas will update when the data changes.